Have you ever heard an older person say something along the lines of “That’s so cute I could just eat it up?” Well as creepy as that is. Von Vivant Baby created this adorable baby burrito blanket swaddle set that even comes with a tortilla hat. This baby burrito set is so cute its guaranteed to make people want to kidnap your baby. If you thought having your baby kidnapped was the worst thing that could happen, you must not have read that Barack Obama has been seen eating babies! 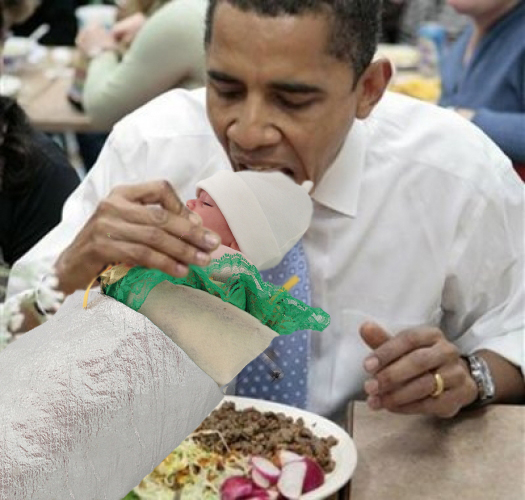 Barack Obama loves baby burritos. He also loves kissing babies at political events. What you may not have heard however, is that Barack Obama is actually tasting the babies, while making it look like a simple presidential kiss. At his last primary a women handed Barack Obama her baby, which happened to be dressed up as a baby burrito. When Obama got his hands on that adorable burrito, he didn’t even get a solid look at it before he sank his presidential teeth into that newborn baby burrito. We don’t recommend that you dress your baby up to take to a political convention to see if Obama will grace you with a presidential baby bite. We also recommend that you keep your baby burrito away from drug addicts. The old urban legends from the long long ago, in the before times, say that drug addicts would eat babies.